WILL YOU WATCH? : "Preacher Wives" Reality Show HEADED TO "TLC"
As if there aren't already enough urban reality shows based in Atlanta, True Entertainment is about to bring to light a lot of "church drama" in a new reality series called "Preacher Wives." The show will follow the "First Ladies" of Atlanta area churches as they play out their roles in the congregation and at home. It will be interesting to see what type of holy drama the preacher's wives keep up. I'm sure it will cause many debates at beauty shops, women's conferences and churches around the country. 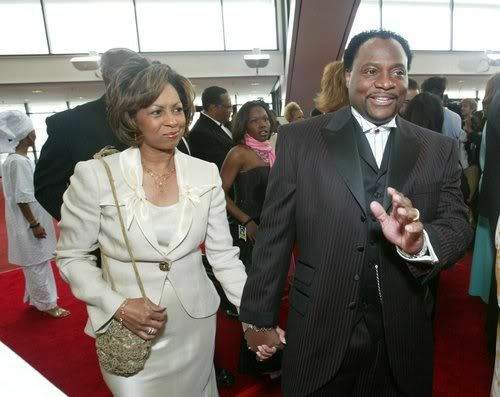 Hmmm...It would be interesting if Bishop Eddie Long's wife Vanessa participated! NEXT: SERIOUSLY?! Tracy Morgan TURNS HIS BACK On Diabetic Mom's HOME FORECLOSURE! I am soo tired of all these wife shows all they are is DRAMA so preachers wives hmmm how are they going to disgrace themselves to get ratings. Most true First ladies do not CRAVE attention. That quote from the producers was a damn mess. You already know they will shape this into some foolery. I vote NO. NOOOOOOOOOOOOOOOOOOOOOOO! Somebody baptize Andy Cohen before he has all of black America looking like a bunch of good excuses to be racist against blacks. These fools PURPOSEFULLY go out of their way to cast outrageous personalities (stalkers and violent offenders included). He's like Howie Mandel or Jerry Springer- lives for drama and bores of peace....Please, somebody stop the "unbeweavable" television producer before we have a new generation of Chrissy Lampkin's, Nene Leakes, and a world that hates those that look like them with as much vehemence as they do rich sport stars who commit crimes and black folks who talk loudly. Make. It. Stop. NOOOOOOOOOOOOOOOOOOOOOOO! Somebody baptize Andy Cohen before he has all of black America looking like an excuse to be racist. These fools PURPOSEFULLY go out of their way to cast outrageous personalities (stalkers and violent offenders included). He's like Howie Mandel or Jerry Springer- lives for drama and bores of peace....Please, somebody stop the "unbeweavable" television producer before we have a new generation of Chrissy Lampkin's, Nene Leakes, and a world that hates those that look like them with as much vehemence as they do rich sport stars who commit crimes and black folks who talk loudly. Make. It. Stop. I am amazed at how easily people will auction off their lives for profit. "It's all about money, ain't a damned thing funny. You got to have a con in this land of milk and honey." Pitiful. I will absolutely NOT be watching this mess nor any reality show. Its bad enough that those shows prey on the simple minded by drawing them in to a scripted version of reality laced with a heavy dosage of ignorance. But, to see Christians taking the name of Christ to this kind of foolishness? No ma'am. I refuse. I don't really like the idea of this show, as if Christianity doesn't stand its fair share of ridicule already. They had to go and create such an idiotic idea of a show. The last thing I want see on my TV, is a bunch of crazy women who call theselves "first ladies" ridiculing themselves and Christ for the entertainment of others. If the women of RHOA actions are by any indication, I really don't want to see another bunch of Atlanta idiots on TV as a representation of my faith. A strong Judgment is coming to Atlanta soon!!! God is that you????????????? What you doing on YBF.com????????? oh yall gon' learn today how these bible thumbin' pimps in the pulpit hypocrites get down!!!! I would MOS DEF b watching Black 1st ladies in the church are a TRIP! & they go thru alot dealing by being married to preachers (jealous men, volatile & moody husbands, etc). Cant Wait!!!!!!!!!!!!!!!!!!! I'd NEVER watch. I don't like the majority of reality tv. ATL needs to stop it! Global Grind posted that they also have another one called "The Mistresses Of Atlanta." Shows like this give credibility to people who think that all black people are the same. It's ignorant to think that way but it still gives a reason to argue. I keep reading people say "that's why I'm not religious", or "I don't like religion". Jesus condemned religion as well, which is why He was hated. Man loves religion and rituals. Religion is a form of control used mainly by the devil and man. Jesus came and died for you so that you could do away with the religion and have a personal intimate relationship with Him. What makes a person a Christian is the fact that they are a follower of Christ and His commandments, not because they attend Bishop So and so's church or give x amount to Passa So and So. Stop blaming religion for why you are ignoring the The Most High. You will be held accountable to your actions. I couldn't have said it better myself. This is what the world does not know. And it is uo to us to remind on a daily basis. Good Job. You hit the nail on the head. Stop using the shortcomings of Christians for an excuse not to accept Jesus Christ as your Lord and Savior. God isn't going to want to hear why you didn't accept His gift of salvation because of other people you were watching. All spoken like true Christians.......which is why many of you will STILL watch this show. -lol Ironcially, Christianity would be beautiful if it weren't for most of the Christians. If Jesus condemned religion, then why are y'all calling yourselves Christians??? Jesus didn't call himself a Christian. Your right Jesus was not a Christian, however because the jews did not believe that he rose on the third day, God offered Christianity to the non-jews because they believed Jesus died and rose on the third day, while Jews believe His disciples stole His body from the tomb and are still awaiting His comng. Being a Christian and being religious are two totally diferent things. Will I watch....I apologize Jesus...BUT...HELL TO THE NO!!! Spare me the agony. Please. Why should we watch this crap and make them even richer???? Nope. Do FOL4 and I'll watch that. LOL! Uhm...This is a hot saved mess! I'm telling ya'll this reality shyt is headed for a TRUMAN moment. If you didn't see the movie...rent it. Its so sad. Enough of the ridiculous reality shows. Damn....at what price do you sell your soul for the almighty dollar? These reality shows are single handedly eroding at our societal values, norms and morals. People may think they can continue to watch these shows unaware of the agenda at hand, and not be effected, they are fooled. When exposed to something over and over again one tends to accept it as normal. Programs are called programs for a reason. You are being programmed, hence programming. We copy the things we see on TV especially when those things are repeated all day and all night. Never in history have I seen programming repeated like they do reality shows. Just think of the type influence shows like Bad Girls Club - where unruly sluts are glorified - has on young impressionable girls who come from broken homes. Now the agenda is targeting Christian homes. You have to ask yourself how much these pastors wives are devoted to The Lord Most High when they are about to let the devil into their homes. You know they'll be filming these women in a negative light. I hear what you're saying, but the key word is watching it. Personally, I don't watch reality shows, and don't have any interest in doing so.